Good for you! Do you know, I ordered that Lilly bib from your shop without even realizing it was you? Total pg brain, but I jut saw it and liked it, without realizing the seller was a blog friend! Must have been a very blonde day. 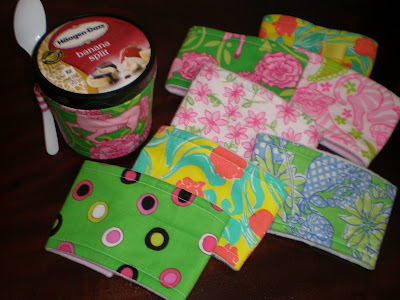 I think your little ice cream koozies are adorable. I can't have one though because we haven't had ice cream in the house for over a year. who knew you even had an Etsy sight??!! I would have been shopping there all this time! What is your Etsy site? I love your stuff!! What is your etsy link; I definitely want to buy one! !